"If capital had been built the way Adam Smith and Marx described, thousands of years would be required for the emergence of the current oligarchs. In reality, they emerge very quickly, and in the West as well." We talked about the phenomenon of the global super-power and its "economic projection" in the previous column. Today we will discuss what the greatest minds (from pre-Marxist utopian socialists to Alexander Zinoviev, the first post-Marxist) considered to be absolute evil: private property. About as many scholars saw this institution as an inherent human quality that nowadays is even registered as a natural human right. One thing is beyond doubt: private property and its sacred status have been the backbone of Western society, just as its renunciation and absence was a key attribute of the Soviet system. Since the so-called bourgeois revolutions, starting with the English Revolution and ending with the 1991 Russian bourgeois counter-revolution, the formation of "the sacred right of private ownership" was the main result of these events, becoming the foundation of all social structure and the main mechanism for reproducing the traditional Western ruling class, and hence, the power. In Russia, private ownership never took on the role of this mechanism, even prior to the Soviet rule, not to mention during it. The reproduction of the ruling class, and hence the power, outside of the institution of private property, or rather with its complete rejection, developed into one of the major Soviet problems. This problem became the main driving force behind Perestroika and the 1991 Russian bourgeois counter-revolution. The Soviet party nomenclature, our ruling class, had grown weary by the 1980s. The Soviet ruling class failed to come up with a mechanism of its own reproduction, and hence the reproduction of power relations. Regrettably, various forms of reprisals within the ruling class were the only mechanism of its renewal and the only potential career ladder. A member of the nomenclature could lose everything in an instant. Expulsion from the nomenclature meant practically complete de-socialization. This was the main source of displeasure for the Soviet ruling class. The desire to establish a hereditary right to power and create mechanisms for reproducing social status under the Western pattern was one of the main causes of the Soviet Union's disintegration. To achieve this, it was necessary to establish "the sacred right of ownership" in the country. The masterminds of post-Soviet privatization (Anatoly Chubais and his team) no longer conceal that its real goal was to create a new class of large private owners rather than develop new efficient mechanisms of economic management for national development. They succeeded in doing this. The reelection of President Boris Yeltsin in 1996 is telling in this respect. At the start of the election campaign, the country's major private owners (the so-called "Semibankirschina," which means "seven bankers") began to flirt actively with opposition candidate Gennady Zyuganov, thereby creating the threat that Boris Yeltsin would not be reelected. As a result, Yeltsin was even considering a way of holding onto power by force. Under the circumstances, the Chubais-headed group of "seven bankers" offered Yeltsin a deal. They would conduct elections that would keep Yeltsin in power without the need to resort to force, and Yeltsin would thank them by transferring to them the country's largest and most profitable state-owned assets. The deal went through. Yeltsin "won," and gave the best industrial assets to the oligarchy through collateral auctions. This deal was approved by the Western super-society. Privatization was the only real economic process in post-Soviet Russia. All major Russian capital was produced by political decisions of the authorities and had nothing to do with entrepreneurship, managerial skills or scientific know how. The problem was that vast private property and capital were established in Russia as structural elements of Western super-society and were supposed to be beyond the reach of the Russian government. Yeltsin found himself in the role of a puppet. Privatization did not produce classic reproduction mechanisms for the national ruling class, but created the infrastructure of what Zinoviev called "Westernist" super-society. 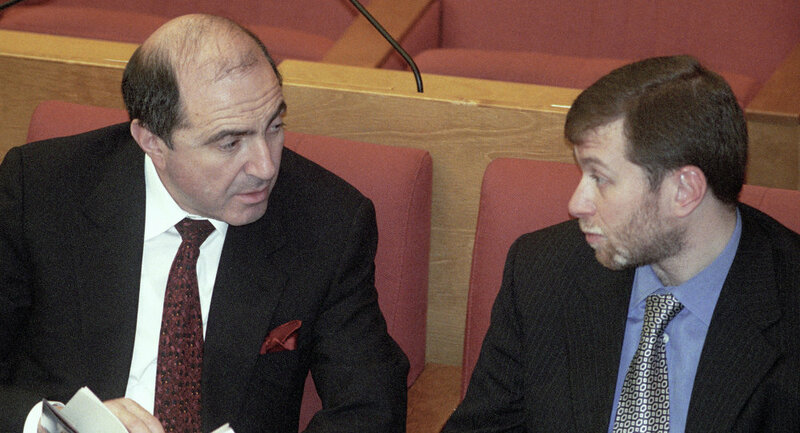 Russian oligarchs planned Yeltsin's resignation and Putin's election as a strictly PR project, but it fell through. Putin did not become a puppet of the oligarchs, and even established some control over capital. But this is just a temporary condition rather than the resolution of the issue. Putin has succeeded in doing this, but the next president may not. Or he may be an agent of capital. It goes without saying that we must offer amnesty on capital returning to Russia to limit the West in its ability to use it as leverage. Understandably, this does not resolve the problem in principle. So what is left? Nationalization? Return to the Soviet project? In one of his last interviews in 2006, Zinoviev said: "If humanity does not overcome the world's evil — private property — it will perish." He was always very scrupulous in his use of terms, definitions and notions. We think it was no accident that he used the term "overcome" rather than destroy, prohibit or eliminate, although this is exactly what Marxism and the Soviet project demanded. The latter no longer required complete renunciation of private property, and merely banned private ownership of the means of production. We believe the problem of humanity is not in the institution of private property per se, but in its assertion as the general principle of social organization. This is the first point. Secondly, as a consequence, the problem boils down to the symbiosis of the institution of private ownership and power, which is a systemic factor in human society. Overcoming private property means allotting it a proper functional place in society. According to Marx, the right of private ownership that underlies the formation of capital is an economic and commercial right. Marx viewed the emergence of capital as an economic phenomenon. He said almost nothing about power as some special substance, but completely identified it with the state and predicted the eventual extinction both of private ownership and the state. In his theory of imperialism, Lenin viewed the symbiosis of capital and power as the condition for and main mechanism of reproducing both substances. Today the picture has become even more ominous: capital, which has become super-society in the social sense (according to Zinoviev), has turned the state into a single power channel that is far from being the most important one. The power usurped by capital via the structures of super-society is no longer regulated by the state. It is completely free of the state, which no longer restricts power. The power that is being used outside the state is becoming a super-power. Under this super-power, the right of ownership is undergoing transformation. This right is no longer "sacred." Having subordinated the state, the super-power uses this right as it sees fit. A vivid example can be found in the resolution of the financial crisis on Cyprus. It is no secret that the same method will be used in the entire European Union, if necessary. Sanctions are another example. The super-power no longer needs the right of private ownership for its reproduction. The institution of private property was "sacred" only within the state and its jurisdiction. Super-society and the super-power are enemies of the state. Their assertion leads to the extinction of both the state and private property, as Marx predicted. This is the true irony of history. The communist line aimed at the complete elimination of private property, and subsequently the state, from the very start proved to be historically problematic, and it is clear why. 2) draw a clear-cut division line between economic and political rights. Those who enjoy the right of ownership should be barred from having political rights, and hence, power. Those who are in power should not be allowed to enjoy economic rights, ownership, capital accumulation and wealth. The current forms of division between business and government fail to fulfill this function. Moreover, they serve to mask the real super-power. I'd like to recall that the main demand of bourgeois revolutions in Modern history was the acquisition of political rights by the Third Estate: the bourgeoisie. They demanded power. Now we are facing the results: the consolidated structures of super-society and super-power. Instead of demanding political rights for the bourgeoisie, it was necessary to compel the ruling strata to give up their economic rights. Obviously, this was impossible at that time, but now it is a major requirement for our new social project, which we must carry out if we want to keep our Russian civilization free of the power of what Zinoviev described as "Westernist super-society."